The iPhone X display is the most outstanding screen in the iPhone's history. It supports 3DTouch pressure-sensitive operation and supports HDR display. iPhoneX use FaceID face recognition. In addition to traditional light and distance sensors, the forehead is integrated with infrared sensors, and its front camera has also been upgraded to 7 million pixels to support self-timer background blur. iPhoneX joined the wireless charging function, supporting IP67 waterproof and dustproof. The A11 Bionic processor powered by the iPhoneX adds artificial intelligence to the neural network and AR support, and is equipped with an Apple ISP designed to enhance photography. Until the release of the iPhoneX, the most powerful processor in Apple's performance. 1. There is a flashing white bar at the top of the screen, and the screen touch is not good The touch IC (integrated circuit) has failed and the repair cost is not high. 2. quickly dropped to 60% -70% after full charge, plug in the charger and return to the original power Plus models are not common, change the battery. The problem is not in the fingerprint recognition module. If the brush cannot solve the problem, replace the screen back plate and brush it again. The problem may be that when the shell is replaced, no WiFi signal enhancement module is installed, and the WiFi cover can be replaced or replaced. It may be that the end plug transmitter is faulty. Replace the tail plug. If the problem still occurs with hands-free, you need to replace the line of light. In general, there is a problem with the light perception line. When you make a call, hold your hand to the opening on the top of the iPhone screen. If the screen does not go out, replace the line of light. In addition, the hands-free microphone, light sensor, distance sensor, and front camera are all on the same line. Any one of the problems requires replacement of the entire line. There is a problem with the handset network. Most of the time, the problem with the handset is due to the handset network. This is usually caused by the handset problem. It may be because the Home keyboard is too tight, or the glue on the Home button loses its viscosity. Press and hold the bright spot to see if there is a color change around it. If it is there, it may be because the screws are off the bottom of the screen. If there is no color change, you need to replace the screen backlight, if the problem has not been resolved, you need to replace the entire screen. 11. 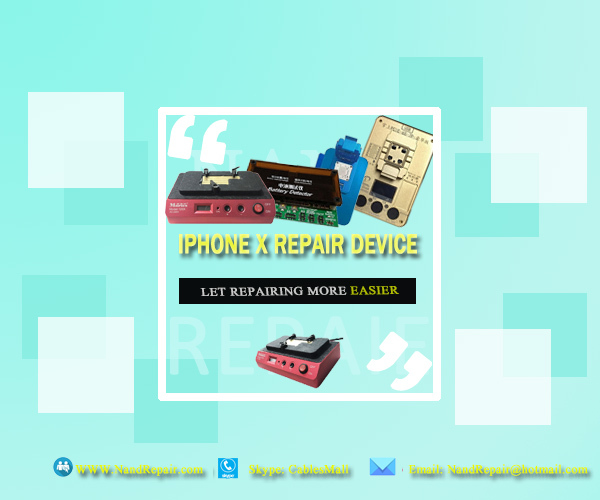 Some of iphoneX professional device, such as PPD120E Desoldering Unsolder Tool, iSocket Jig For iPhone X Motherboard, WL MINI PCIE NAND Flash IC Programming Tool etc, is Used to solve all iphonex issues which is Including the above example. The iPhoneX reserves a touch bar at the bottom of the screen. In any case, just tap the bar and swipe up to return to the home screen. Since there is no Home button, the iPhone X's screenshot is changed to hold the power key and the volume + key at the same time. The original power button is now replaced with the Siri button. Just press 1-2 seconds and the system will wake up Siri. Of course, you can also enable "Siri, Siri" to wake up Siri by voice. PS: Shutdown requires pressing the side button (Siri button) and any volume key at the same time. Double-clicking the Siri button wakes up Apple Pay. There are two ways to switch App from iPhone X. One is to press and hold the touch bar on the bottom of the screen to slide upwards. The finger pauses in the middle of the screen. The system will call out the multitasking menu; slide it left or right in the bottom direction of the screen to quickly Switch recently opened apps. Another method is to use our common left button to call out the multitasking menu. Swipe upwards and pause (there will be tactile vibrations) and press and hold the app. Then you can close the app by sliding the App up or clicking the red button. FaceID is very simple to set, as long as the head slowly followed by the circle in the interface rotation, the circle will change from white to green, complete two scans after the FaceID entered successfully. Measured, after the screen is lighted, the system is quickly unlocked, which is more convenient than TouchID. Dirty fingers or Home keys in the past can easily cause recognition failure, but Face ID does not appear. When you turn on the above mentioned “Gaze at the Screen” feature, it will also bring a lot of hidden features. When there is an incoming call, if you don't notice (that is, when your eyes aren't looking at the screen), your phone's ringtone will keep playing at a high volume. And when you look at the screen, the ringtone will gradually become smaller, a very small human function. Another hidden feature is that when you don't look at the screen for a certain period of time, the brightness of the screen is automatically reduced to save power. In the same way, as long as your eyes keep looking at the screen, the screen will remain bright and not darken. 9. remember to open "use FaceID need to look at the screen"
The infrared depth monitor directly above the iPhoneX can monitor your face information from all directions, ready to unlock the phone for you. But in some cases this convenience seems to have evolved into a risk, so we recommend that everyone turn on "Using FaceID needs to look at the screen". This way, the phone will only unlock when your eyes are looking at the screen, which is relatively safe. Animoji is a dynamic extension of emoji expressions. As long as your face is facing the screen, iPhoneX can detect changes in expressions and generate interesting animations.